G&G Custom Homes is now building in the Gray Oaks neighborhood, a new community located in the heart of Carmel, Indiana. The minute you pull into this beautiful community, you’ll notice it isn’t like other Carmel communities. You will notice, however, beautiful custom homes, wooded lots, and incredible pond views. The lots and homes in Gray Oaks are all designed to enhance the natural beauty found all over the community. The best part, though, is your opportunity to create a customized home that fits your lifestyle while selecting a lot that matches your needs. When you build a custom home, you expect the interior and exterior of the home to look incredible. But, what you’ll find at Gray Oaks is that the homes aren’t the only things that take your breath away. We’ve designed the custom homes in this community to enhance the natural beauty of the area. With walkout basements that lead to incredible views of the ponds, these homes and lots are sure to take your breath away. 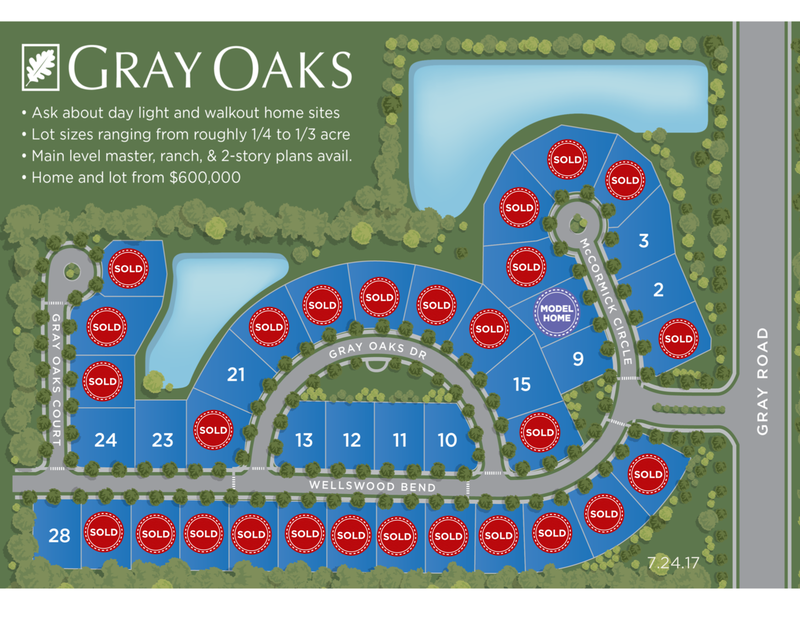 While other communities restrict your home building options to just a few floor plans, Gray Oaks offers more customization to fit your lifestyle. Recognizing that not every homebuyer wants their home to look like their neighbor’s, the custom home builders at G&G have worked diligently to create floor plans that meet a variety of needs. These plans feature main level master suites, walk out basements, and plenty of room for your family. Choose from luxury ranch and 2-story home designs. More than custom home designs and breathtaking views, at Gray Oaks, you’ll find a community you can call home. Gather with neighbors for a backyard barbeque. Spend time with your family walking the tree-lined sidewalks or even enjoy a picnic in one of the outdoor community areas. It’s our goal and mission, once you’ve selected your own beautiful lot, to design and build a place for you to call home. Schedule a visit today and we’ll help you get started with this new, exciting, and beautiful phase of life.